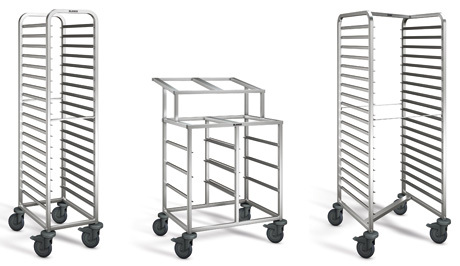 Regardless of whether it is a matter of transport, short-term storage or long-term storage – the shelf trolleys from BLANCO will make any chef happy. They are available for an extremely broad range of applications, from Cook&Chill to dessert and salad distribution. Shelf trolleys, dismantled: Delivered dismantled in a compact Flat Pack for self-assembly. In this way, you can save transport and storage costs. The rugged all-round base frame ensures an extremely high level of stability. Integrated tip safety also due to the special U-profile of the support rails. Cross struts increase the overall stability. Thanks to their offset arrangement, they can also be used as support rails. Tube clamps without tapering. This not only guarantees a beautiful, functional design, but also ensures maximum hygiene because there are no dirty edges. The push-through protection is mounted on both sides and thus ensures safe transport in every direction. All shelf trolleys are equipped with a strong bumper rail in the new rugged design. They protect the trolley and inventory against damage.